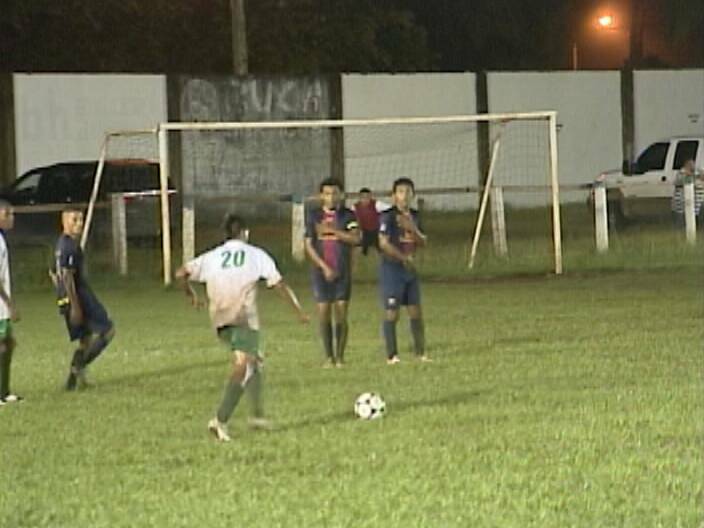 Week 8 of the PLB Football Competition saw Police united play host to FC San Felipe Barcelona inside the Isidorio Beaton Stadium Saturday night as teams intensify their bid to make the post season – now just 6 outings away. Showing much more urgency, the Police looks to open the scoreboard in the 2nd minute of action on this set piece triggered by Orlando Jimenez which forces the Barcelona keeper to push it over the crossbar. On this corner kick, goalkeeper Bryan Hernandez does look a bit shaky when he comes off his line for this punch attempt but he does get away with it. Meanwhile folks, this defensive interplay between Jermaine Jones and Kishane Pech in the Police defense can only be described as a perfect case of living dangerously. Some 15 minutes in San Felipe’s Orvin Wade launches this spot kick into the box. The Police defense can’t prevent it from reaching Oscar Acevedo who slices the ball past a diving Charlie Slusher and the visitors are up 1-zip. The Police response is fast and furious as they look for the equalizer and Shannon Flowers should have done better with this look at goal off the set piece. However, 3 minutes later, Orlando Jimenez picks out Amin August off this corner kick and his header ties the ballgame at 1 apiece. At the 30th minute, Amin August fires this grass head burner at goal; Hernandez misplays the ball which allows Evan Mariano to score into an empty goal as the Police takes the 2-1 lead. Danny Jimenez then bends this ball beautifully around the 2 man wall, Amin August helps it along but Evan Mariano negates the goal with the handball violation. I minutes into the 2nd half play, Danny Jimenez mounts this impressive individual effort to beat the goalkeeper rather easily to make it a 3-1 lead for the Police. 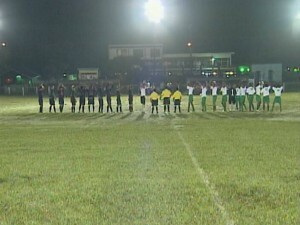 Police United would go on to post the 3-1 big W.
In other results from around the league, Verdes burned FC Belize 1-zip; the B.D.F. 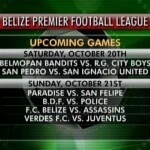 edged Paradise Freedom Fighters 3-2; the bandits continue to roll with a 2-1 Win over San Ignacio; Placencia Assassins blanked Juventus 2-nil and RG City Boys dropped San Pedro Seadogs in a 3-zip shelling. 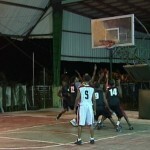 Thus in Zone A, Belmopan has zoomed to the top with 19 points; the B.D.F. 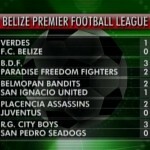 and FC Belize both show 14 points apiece; Juventus has 9; FC Barcelona 5 and San Pedro is at the bottom with 4 points. 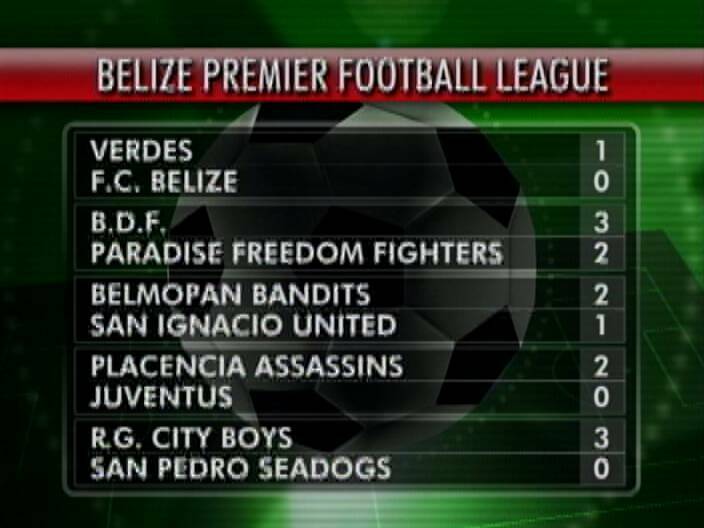 And in Zone B, Placencia leads with 19 points; the Police is next with 18 points; Verdes FC has 16; RG City Boys 10; Paradise Freedom Fighters 7 , while San Ignacio remains in the cellar with a mere 2 points. 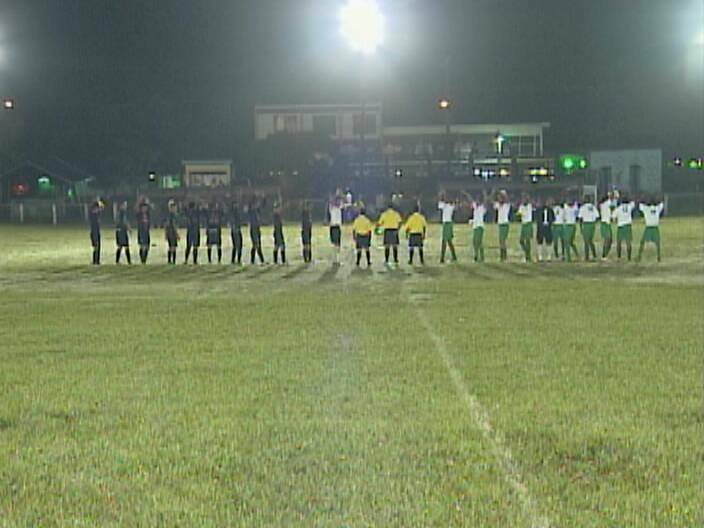 Looking ahead, Week 9 finds Belmopan hosting City Boys Saturday night. On Sunday, San Ignacio travels to San Pedro, Paradise Freedom Fighters head to San Felipe Barcelona, the B.D.F. 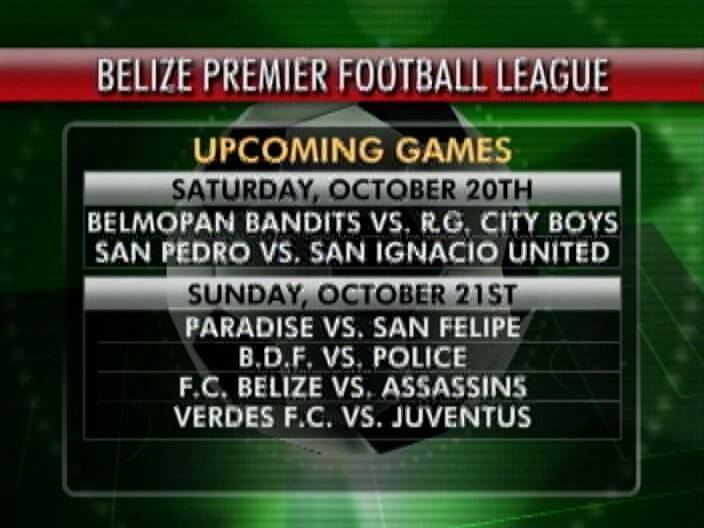 will host Police United, FC Belize will take on Placencia Assassins at the MCC Grounds and Verdes sees action against Juventus at the Louisiana Football Field. In other football news, play in the Smart Mundialito on Saturday saw Kenyon Lewis shake the net as Hattieville stopped Young Stars 1-zip. While in the final game on the schedule, Kenroy Linarez scored the only goal of the match to give St. John’s Vianney a 1-zip Win over Jane Usher. 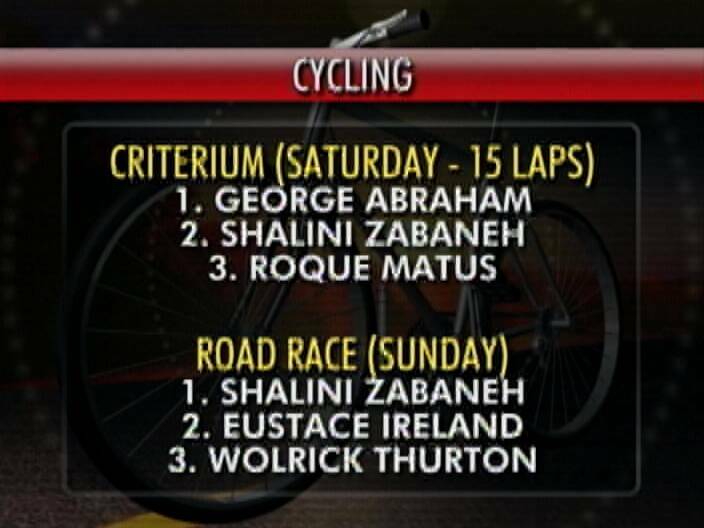 In cycling news, George Abraham had to turn on the afterburners to edge Shalini Zabaneh to grab the 15 laps criterium presented by the Weekend Warriors in Punta Gorda on Saturday. Both were timed at 1 hour 25 minutes 24 seconds. 3 minutes later, Roque Matus come in to take 3rd place. 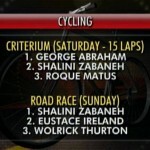 In Sunday’s Road Race from TIDE to Big Falls and back, Shalini Zabaneh took top honors in 1 hour 51 minutes 10 seconds in uncontested fashion. Eustace Ireland then beat Wolrick Thurton in a sprint for 2nd place. 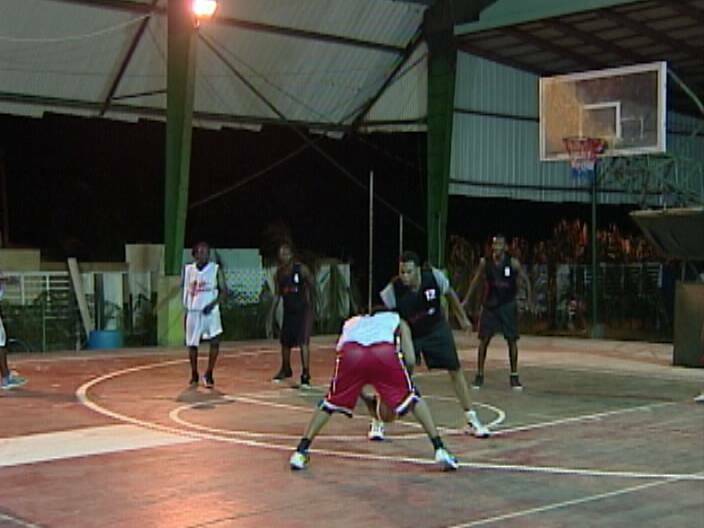 Turning to the basketball scene, we caught the showdown between Airport and B.T.L. 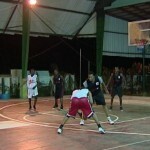 of the Belize District Basketball Association Firm Tournament Friday night at Big Birds Isle. We’re in the 2nd quarter when Vince Lamb of Airport finds Floyd Talbert down low and the big man goes glass, gets the bucket and is douled to get 3 the old fashioned way. at the other end, Otis Clother deals to Edward Thompson who penetrates for 2 of his team high 20 points. On this B.T.L. possession, it’s Lupito Acosta finding. Thompson on the breakaway and the 2 is automatic. Acosta on this press is stripped from behind by Vince Lamb, Frankie Rivas comes up with possession and finds Kelvin Gillette who scores the uncontested layup and would finish with 13 points. Nevertheless, B.T.L. keeps coming and at the end of this penetration, Lupito Acosta gets the friendly role for 2 of his 17 game points. And at halftime, what was a 9 point Airport lead is down to 2. In the 3rd quarter, Airport regains its swagger—Paul Swasey deals to Vince Lamb and the Postman strikes for 3 of his 22 points. Marion McKoy’s turnaround is short, but kept alive by Paul Swasey who then controls the rebound and puts it back up for 2 of his game high 23 points. And at the end of 3, the 9 points lead has been reestablished. In the 4th, Akeem Bermudez goes to the Postman who penetrates for 2 more Airport points. Paul Swasey strikes for 3 more right as he dials from long distance. The postman then hooks up again with Swasey who sinks the jumper as the Airport goes on to record the 72-60 big Win. 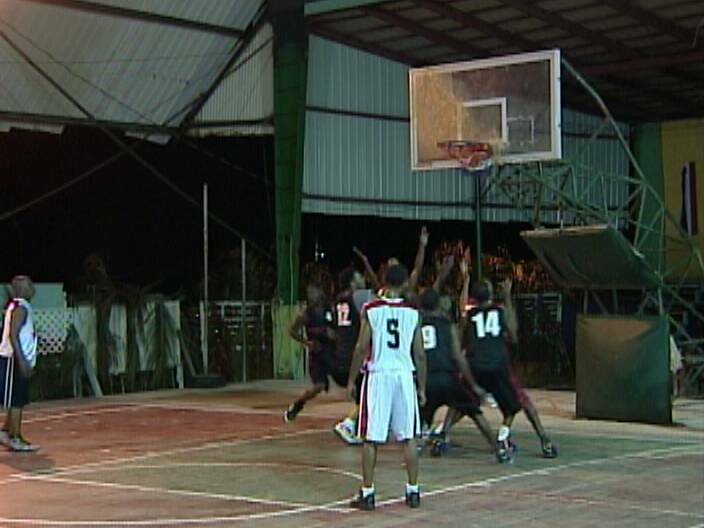 In other results from over the weekend, Central Bank broke the Belize Bank 62 to 26 and Port of Belize shook up Smart 69 to 31. The top 2 teams in the standings are Airport and BWSL who both show undefeated 5 and 0 records at this juncture. Finally folks, in baseball news from CODICADER, Belize finished with a 2 and 3 record after beating Guatemala 6-2 last night. Pitcher, Eduardo Carmona of the San Pedro High School Team, struck out 18 to win the individual medal for the most strikeouts and we say congratulations to Team Belize for its showing in its 1st International baseball appearance. Overall, Belize won 10 gold, 1 silver and 3 bronze in CODICADER and that’s a pretty good haul. Another Aggravated Burglary; guise now a police officer? Superstar! Who will win the $10,000 Cash Prize?